I got a call from a person who was out of town on a business trip asking if I could pickup merchandise stored at a warehouse in Philadelphia. The merchandise had to be picked up the next day to avoid being fined a storage fee of $150 per day, so I said yes and rearranged my schedule to have the next day off. I loaded up the Brompton bicycle and took off for Philadelphia. Hauling the merchandise from the warehouse to its new storage location required renting a U-haul 10 foot moving truck To avoid any parking problems or fees, I parked my car at the person’s address and rode a Brompton bicycle to the local U-haul rental location. 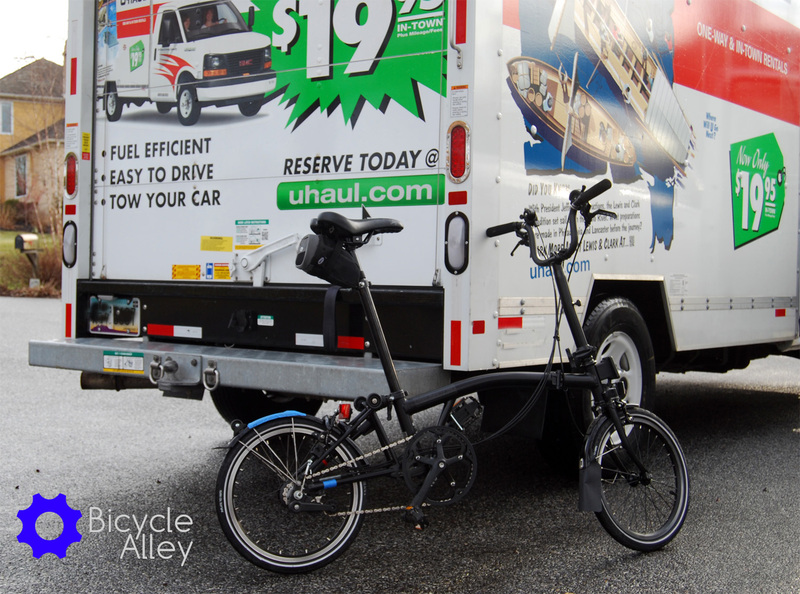 Because I was using a Brompton folding bicycle I could easily fold it up and store it in the U-haul truck while moving the merchandise. I printed out Google map text instruction for navigating, but I also had a Garmin Touring bicycle GPS. Sometimes the Garmin doesn’t give the same route as Google maps, so I like to have more than one option and choose the best route. The route from my parking location to the U-haul rental yard was approximately 2.5 miles and took 14 minutes. The roads were very narrow and unfriendly to bicycle’s, but most of the trip was in low-traffic residential neighborhoods, so it wasn’t too bad. I used the Bell Arella 100 tail light to make the bicycle more visible to traffic. I ran into one of the most unfriendly bicycle roads towards the end of my ride to the U-haul rental yard. It was very congested with traffic and had a cement and metal divider running down the center of the road and dividing opposing traffic. This made it difficult to cross, so I rode the Brompton bicycle in the opposite direction to find a place to cross the road. I figured I could cross at the next intersection, but instead I found signs saying no crossing. I couldn’t believe it! I ending up having to ride in a left turn car lane to make a left turn onto the congested road, and from there I was able to ride straight to the U-haul rental yard. 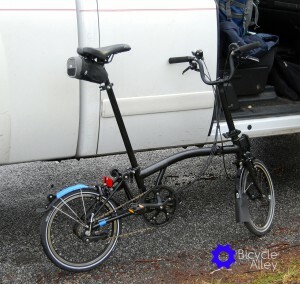 After moving all the merchandise and returning the U-haul moving truck, I unfolded the Brompton bicycle and rode back to my car and came home. 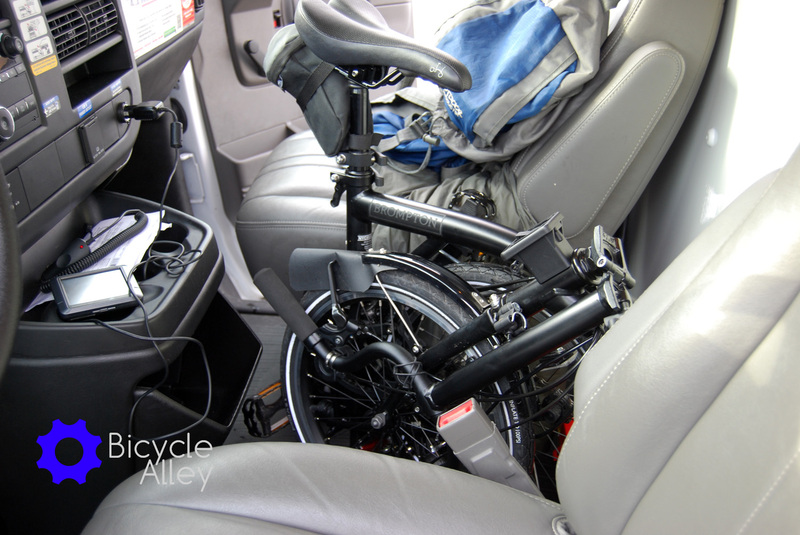 The Brompton bicycle unfolded and leaning against the U-haul 10 foot moving truck.